Writing an account of the 2004 Hunting Act may sound like a dreary task. It wasn’t. I’d been following the hunting debate for several years before the Labour Party came to power. Labour had made it clear that it would do its utmost to ban hunting with dogs, and I spent a good deal of time in the countryside, talking to masters of foxhounds, horse dealers, farriers, hunt follows and other involved in the sport. I also interviewed hunt saboteurs and anti-hunting campaigners. Shortly before Labour won the 1997 election I came across Jim Barrington, who had recently given up his job as Director of the League Against Cruel Sports, having decided that a straightforward ban on hunting would lead to greater cruelty, not less. He became a great hate figure for the animal rights lobby. He was remarkably brave and always good company. I wrote a leaflet for his new organisation, Wildlife Network, advocating licensed hunting. Later, when the Hunting Act came into force, the All Party Middle Way Group of MPs, for whom Jim now worked, invited me to write this book. 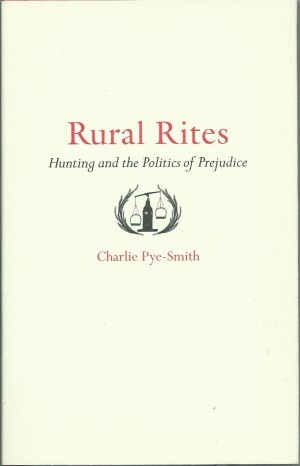 Rural Rites provides an account of an absurd political process, involving 700 hours of wasted parliamentary time, and the passage of the law which has done nothing to reduce suffering in the countryside, and quite possibly the opposite. The book examines why MPs voted for the ban – as far as many Labour politicians were concerned, this was a splendid exercise in class war – and how the anti- hunting lobby corrupted scientific evidence to make its case.